Docker 1.13 introduced a new version of Compose that simplifies deployment. In our last webinar, Alexei Ledenev (Cheif Researcher at Codefresh) walked us through the new features in Compose V3 developers can use for deployment. In case you missed it, we recorded it for you to view on demand. During the session, you’ll learn how to quickly create a multi-node Swarm cluster on your laptop, (without needing to install and manage additional VMs). Docker launched Docker for Mac/ Windows last year to provide native platform capabilities and a uniform experience across all platforms. Docker for Mac and Windows provides the full Docker development environment out-of-the-box, including the native Docker Client, Docker daemon (running inside a small virtual machine), Docker Notary, and Docker Compose, so you have everything you need. 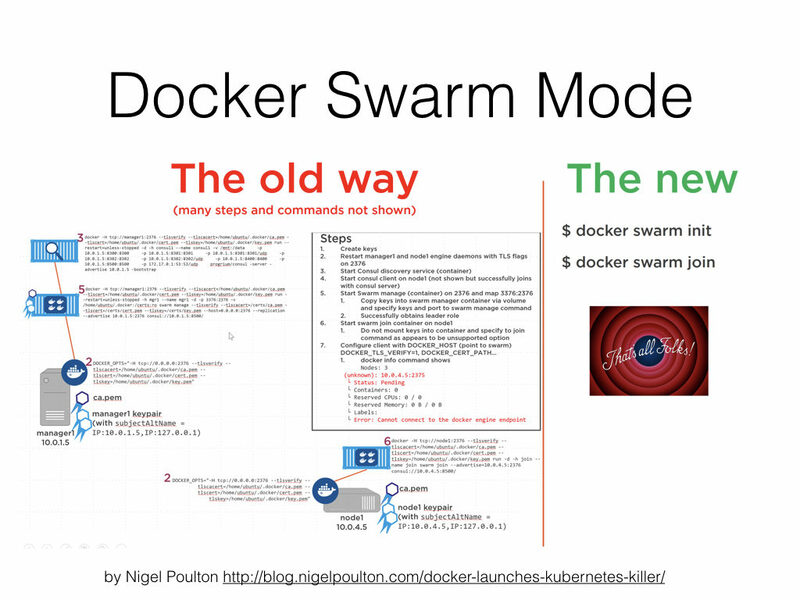 Docker Swarm mode was introduced about a year ago in Docker 1.12. Before that, it was possible to create a Swarm cluster with some key values but difficult to do. A Swarm is a cluster of Docker machines where you have one or more Swarm masters and multiple worker machines. Ideally, you’d like to link them together to a single cluster and be able to deploy your app on this cluster. Before Swarm mode, you needed to create proper certificates and keys, install the console discovery service, start the console agent on the each machine, properly set up all the certificates, and launch each node with all the proper parameters to connect in a swarm cluster. It was possible but was a huge headache. Now you just run Docker Swarm on your master machine, take the token (unique ID), and on the other Docker machine, run the docker swarm join command to pass the token. And that’s it! It will combine both machines on that cluster. New command with Docker 1.13 that allows us to easily deploy our Docker Compose file called docker stack deploy. The Docker client has a built-in parser for the docker-compose.yaml format. It can read the new Docker Compose V3 format including the new deploy section, and deploy what’s described in it. So you can use your Docker Compose file to deploy a Compose application on a swarm cluster. The docker-compose CLI is a python based application that also understands docker-compose.yaml version 3. It has its own parser implemented but it totally ignores the deploy section. So it doesn’t know how to deploy a Compose file on a swarm cluster. The main difference between the two is that the docker-compose CLI only sees half of the compose file. So if you need to use it for testing and deployment, use the Docker client. Before Compose Version 3 (introduced with Docker 1.13) you could do the same things (create services, networks, and volumes on a swarm cluster using the Docker client. But the biggest update in Docker Compose V3 is the feature of stack deployment with swarm. They introduced a new deploy key under the service node. We encourage you to go and clone it to try by yourself!